My 5 year old son Ben loves those spot-the-difference quizzes you find in kid’s magazines. It wouldn’t take him long to tell you what was missing from the bottom brevet card on the right – it’s only half filled out. 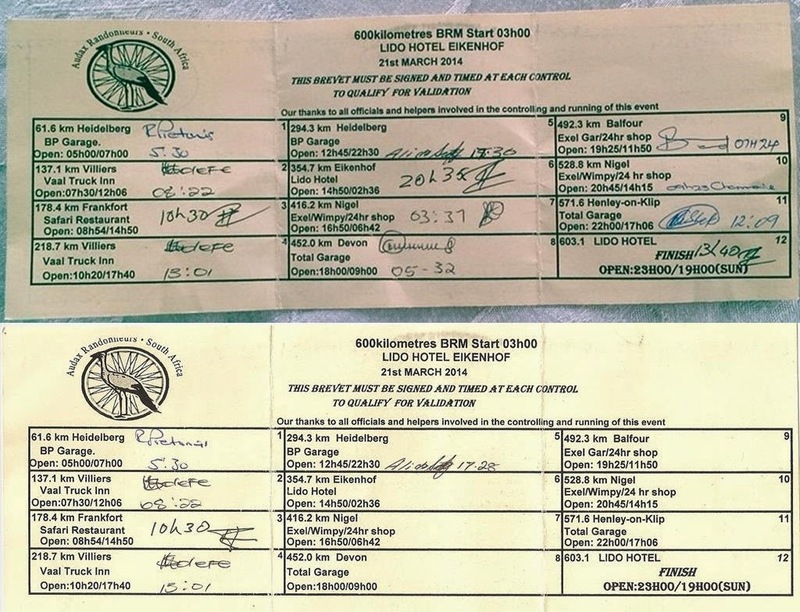 Sadly the incomplete brevet card is mine – above it is my good friend Henri’s, with a full set of signatures for the controls on the Joburg 600km audax ride. Maybe the bad omens had been there from the start – Henri had rung me earlier the day before to say we’d been put in Room 13 at the hotel. We’d joked about unscrewing the number and turning it upside down to properly observe Rule 13. In truth though, my failure to complete the 600 had nothing to do with bad luck and everything to do with poor ride management. Gathered in the car park of the Lido Hotel were a band of 10 riders, including Michelle and Nigel whom I had met briefly on LEL. Gillian had also been on the email list, but had pulled out due to illness. 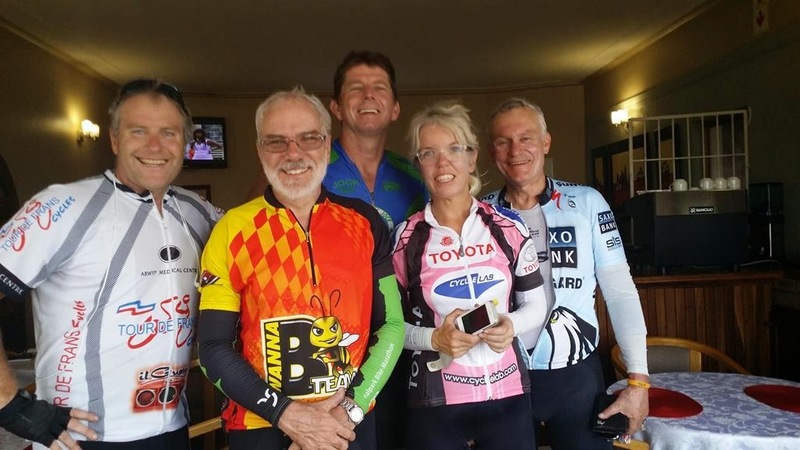 It was also nice to meet some fellow Hubbers in the flesh – GaryvdM, Speed Racer and Underachever – we’d exchanged a number of messages in the build up to the ride.. The Lido had been a pleasant surprise the evening before, smarter than I had expected and the food wasn’t bad either. My views on it at 3am were a little less positive – during the night it had lived up to it’s reputation as a party venue and what Henri termed the “doof doof” music had kept many of us from a decent amount of sleep. Rolling out of the Lido, we took two quick rights and almost as soon as we hit open road the pace started to feel fast. Henri commented as much as we flew down the pitch dark roads out of south Joburg and towards the first control in Heidelberg, The morning was wonderfully cool and fresh, and the riding very pleasant. Despite the pace, it felt natural and good to be sticking with the group of riders. In the dark I had little idea really where we were – I knew our route from studying the map, and could see the track lit up on my Garmin, but that aside I was riding along in a bubble. Small patches of scenery were picked out in the spill off flare of our lights alongside each side of the road, but no real details to stay in the memory. One thing that was noticeable was how quiet the roads were, and how the few trucks that did come upon us seemed to wait behind until they could pass with a decent clearance. It was a refreshing change. Crossing the N3 highway an we rolled into the sodium lit streets on the outskirts of Heidelberg. Somewhere along this stretch I’d become unhitched from the main group and found myself peering ahead to see the directions they were turning to reach the control. Eventually I rolled into the BP garage only in fact a few seconds behind, but already bikes were parked and the guys were inside with control cards. I rushed in, got my card signed, and rushed out with a 500ml water to top up my bottles. A little warning alarm was starting to ring in the back of my head, it was telling me the pace was too high. In hindsight now, I can count two other mistakes at that first control over and above the pacing: my hydration was about half of what it should have been for a fast 60km stretch; and my refueling was woefully short. What I should have done was stopped for 20 minutes, rested a bit, eaten some real food, and drank plenty too. Easy to say now. What I actually did was to snack on an energy bar, wash it down with surplus water from the bottle, and ride out with the group. On unfamiliar roads, in the dark, the safety of sticking with the group drowned out the inner voice of reason. Despite the pace, I was really enjoying the riding – dawn broke as we crested the hill out of Heidelberg. Henri mentioned this was where Joberg2C start as we passed the gates of Karan Beef, the highest point on our route for today. Long stretches of the roads along this section of the ride to Villers were lined with carpets of pink and white flowers – Cosmos Michelle informed us, an alien plant brought over in horse feed during the Boer War. I took the front to show willing by doing my share of the work a couple of times, but in truth I was barely managing to hang on to the bunch, so it was more of a token gesture. Over the last few kilometers to our second control of the day, the Vaal Truck Stop, I was becoming further unhitched. By the time our wheels crunched onto the gravel of the car park and wove through the parked lorries I was probably half a kilometer behind the main group. Henri had dropped back to stick with me, and was now rather concerned about the harsh surface on our tyres. I was very relieved when some of the guys ordered food, and resisted the few lurking outside wanting us to ride on immediately. Henri and I joined them in cheese sandwiches, in my case washed down with the remains of a coke, the rest of it having been dumped into my water bottle. I was feeling quite refreshed as we rode out maybe 15 minutes later, and in fact the riding now seemed easier. We crossed back over the N3, sped down the descent to the Vaal river, and entered the town of Villiers as we crossed the bridge. The town was a picture of faded former glory. Judging by the grandeur of some of the buildings, it must have once been an important town. Now though, many of the shops and buildings looked closed and empty. We rode through the largely empty streets, and over a short stretch of road out of town that was so badly degraded it was barely more than a dirt road. Swinging right onto the main road at the end of town we started along the last 20kms or so to our half way point for the day, the town of Frankfort. The road pitched up to the first of what would be a continuous stretch of rollers from here to the control. Already the group was splitting up, and I decided it was time to accept the inevitable and sit up and ride my own pace. It was a decision I should have made 100kms back in truth, but it was now necessity more than choice. Henri stuck with me – we’d already chatted about letting the group go, so I wasn’t surprised. It was a relief to still have some great riding company. The Highveld scenery may lack the drama of Cape mountains and coastline, but it was considerably more interesting than I had expected. There were a lot of long, rolling stretches, but the riding was far from unattractive. A barn here, a windmill there, and all along dotted buildings and wildlife to draw the eye and mind away from the steady toil. It was much more pleasant riding than I had been preparing myself for. The outskirts of Frankfort were soon in sight, and I was beginning to look forward to a stop and some proper food. I knew the moment my front wheel hit the stone that a puncture was inevitable, and luckily had already washed some speed off before the tyre ran fully flat. I called out to Henri, he was only a few meters ahead but moving fast and clearly my cry of “mechanical” was lost on the wind. I pulled over to change the tube. It was over a year since I’d had to fix a flat, but at this point in time it wasn’t really a chore, I was glad of the rest. I did a cursory skim around the inside of the tyre, but I knew there’d be no spike in there – it was clearly a pinch flat and not something sharp which had caused the puncture. The new tube was in before my phone rang, and by the time Henri had turned and got back to me I was already re-seating the wheel in the front fork. We were sufficiently behind the main group by the time we rolled into town that some of them were already finishing off drinks and snacks and getting ready to head out. Frankfort also felt a little faded from the previous time Yolandi had driven through some years back. To be fair, today was a public holiday and much of the town was closed, and I was starting to become fatigued, so I perhaps wasn’t looking through the most positive eyes. I would have killed for a restaurant for a sit down and plate of hot food. Instead, there was just an OK store with a limited choice of packaged offerings. I briefly looked at the pies and hot dogs, but despite being hungry I didn’t have the courage to brave them. It wasn’t easy to ascertain whether they were today’s or even this week’s. In the end Steri Stumpy, bananas, and water was about all I remember buying – maybe there was something more substantial in there I forget. Eddie had met us at the turnaround point – and I was glad to replace the inner tube I’d used, and also grab some more snack bars from my drop bag in his car. He also signed our control cards before we swung back and started the leg back home for today. It was only 40km back to the Vaal Truck stop, but it felt like 100. My energy was now running low, and without noticing it, I think this was also where I began to slip into a serious lack of hydration. The rollers just seemed to rise and fall endlessly, but eventually we crossed the Vaal again accompanied by some local kids riding on squeaking rusted bikes and staring at us curiously. 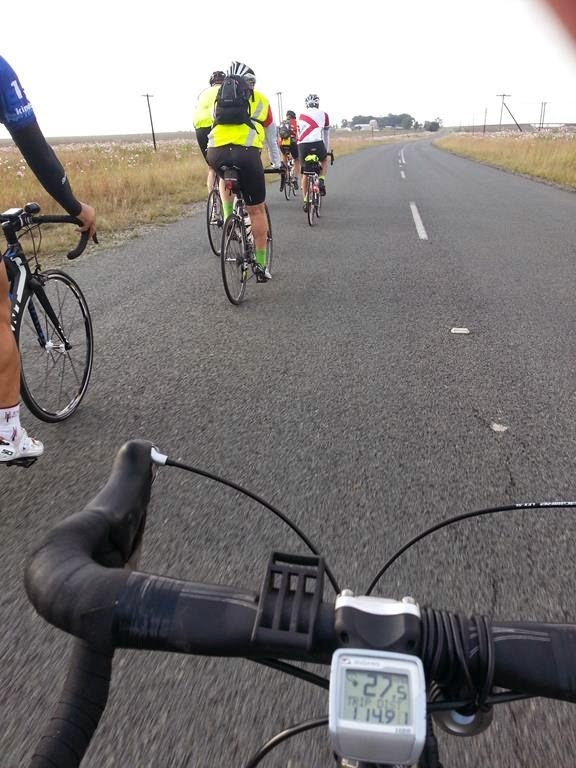 They stopped and waved goodbye as the road rose back up out of the river vale and swung towards the N3 crossing. Cramps had been lingering on the last couple of rollers, but with careful pedaling and mental games, I’d managed to distract myself from allowing them to actually sieze up. But they were hard to keep at bay over those seemingly endless last couple of kilometers. Eventually we were crawling up and over the highway and crunching back through the dusty car park past the dozing trucks to the cafe at the control. I apologised to Henri, but explained that I needed to sit down for some proper food and at least two cups of hot tea. It shouldn’t have taken us long really, but the service was quite slow, so by the time we rolled back out again we’d been stopped around 45 minutes. We still had plenty of daylight though, and would be in good time for an 8 or 9pm arrival back at The Lido for dinner and some sleep. This next stretch would be a tough one though – 75km of steady climbing back up to Heidelberg, and into a headwind. The tea and boerie roll had revived me considerably, but I already knew I was going to struggle. The earlier pace was beginning to take it’s toll. We’d planned for a half way stop, but I had to pull over at around the 30km mark for a quick drink and stretch. Barely back on the bikes we noticed a bike parked at a garage and Kenneth heading back towards it. We dropped our pace and soon he came up alongside us. He and Gary had been leaving the last control as Henri and I rode in, so clearly something major had gone wrong. It transpired that his stomach was suffering, and Gary had ridden on solo. We stuck together over the long slow ascent back up to Heidelberg – Kenneth was riding more strongly than me, but clearly struggling to a degree also. The smoking chimneys of the power station that had flown by earlier that morning seemed to take an age to reach and go past. Eventually we swung back onto the main road into Heidelberg by the Karan Beef entrance again. I made the mistake of thinking we were almost there, but in truth we were still a few kilometers from the control which lay the other side of the town. By the time we were less than one kilometer to I had to pull over, apologizing to Henri once more. The tank was completely empty, and almost nothing was powering my legs. It took me several minutes to be able to get back on the bike, and we fairly crawled the last stretch to the control. I was done. Sat back in the BP garage with both Henri and Kenneth we discussed options as I downed two cups of sweet coffee, took some Rennies, and tried to force some food down. No amount of chewing could convince my throat to actually swallow much though without wretching to bring it back up. Maybe I’d be able to recover in an hour or two, but it just wasn’t worth the guys holding up their ride to find out. I urged them to go on without me, and gave Eddie a quick call to let him know they were on their way over the last stretch back to the Lido for dinner. My Mum and Dad used to call these short calls Scotsman’s – a little ironic since Eddie is in fact Scottish. Sitting there alone in the harsh fluorescent light of the garage cafe I contemplated my options. If I could recover, it would mean riding a stretch of more than 60km solo, in the dark, well below full strength, and past some slightly dubious areas. The alternative was to bail, just a few hours ride away from a hot meal and dinner, a desperately disappointing end to my Joburg aduax adventure. I surveyed the shop for anything that might help. More than once my eyes fell on the Powerade and Energade bottles in the fridge, but I couldn’t convince myself they would do more than make me vomit. I drank more water and coffee and tried to eat a pie and chips. However slowly I ate though it just wouldn’t go down. I’d been at the garage a couple of hours, and it slowly dawned on me that despite having plenty of time in hand, I simply was not getting nearly enough energy back into my system fast enough to have any realistic chance of carrying on safely. I rang Yoli, and then Eddie, and my ride came to a disheartening end. Whilst sitting on the kerb waiting for Yoli I texted Henri with an upbeat message urging him to complete the ride. During the day as he’d started to see me weaken and falter he’d made a few comments about not being able to finish, but I knew he was strong enough to make it if he rode his own ride. The rest of that evening I was still barely able to eat – but at least I managed to start getting my fluids topped back up. The first pee I took back at our friends house was almost the colour of tea. This was the point I realised that as well as bad pacing and nutrition, the thing which had really sapped me and knocked me down as lack of hydration. That also made sense of why I wasn’t recovering at the garage – food and rest will usually sort out energy issues, but dehydration takes a lot longer to recover from. It was only when I counted back on what I had drunk during the ride that I could clearly see how poor my drinking regime had been. It made me wonder if the Powerade would have helped, but it would probably have been too little too late. 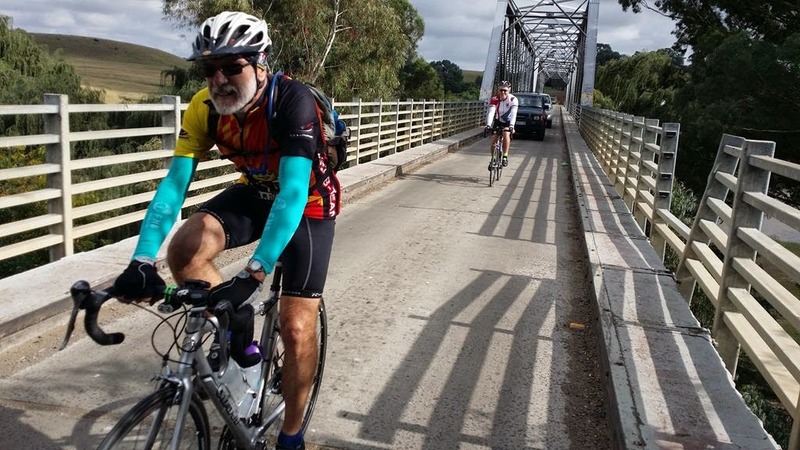 great achievement – his first audax, a distance of 600km, more than double his previous longest ride. I wasn’t sure which emotion was stronger – happiness that he had completed the ride – or disappointment that I had not. My second audax had ended in failure and I had no one but myself to blame. The road to PBP just got longer and harder. Definitely a weekend of mixed feelings, and harsh lessons.